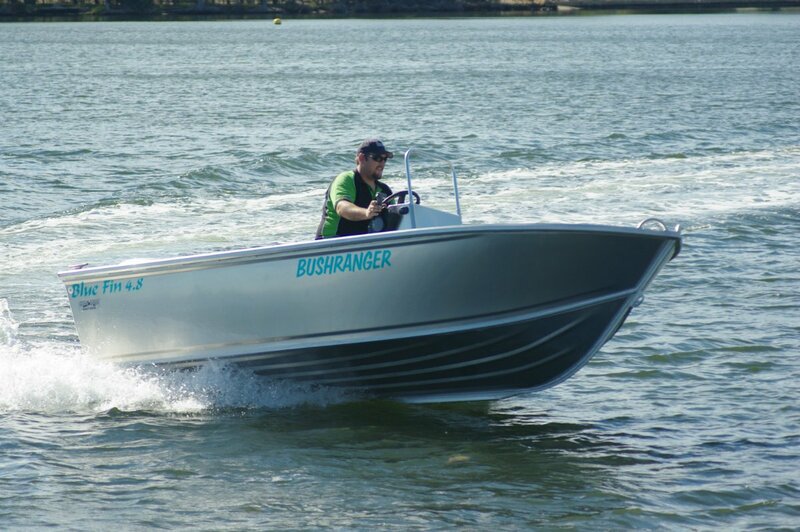 The Bluefin Bushranger 4.8 centre console is about as tough a boat under five metres as I have come across. It concentrates on the essentials and does without the rest – a windscreen for instance, and paint. It is a boat for the fisherman who works his boat hard and does not want to spend mollycoddling time. A blast with the hose and a motor flush takes care of everyday maintenance. Locker doors will not need squirts of oil because there are none. 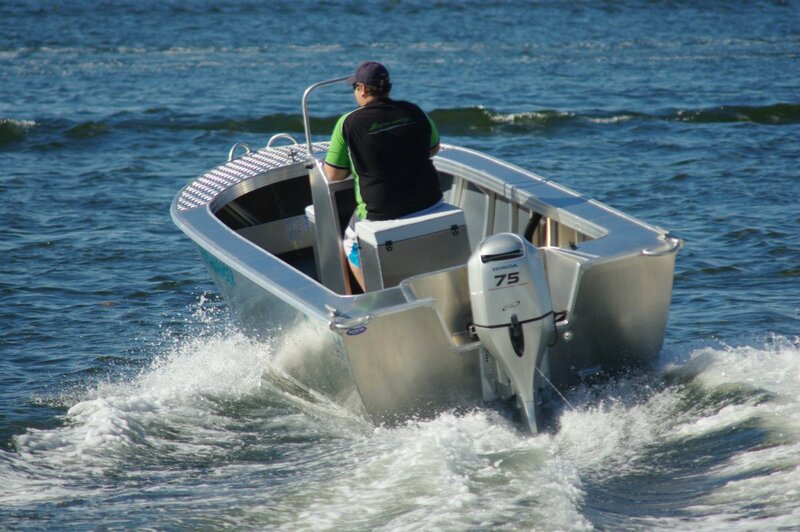 To suit beach launches the bow has a pair of grab handles, matching a pair at the stern, instead of the often futile bow rails. 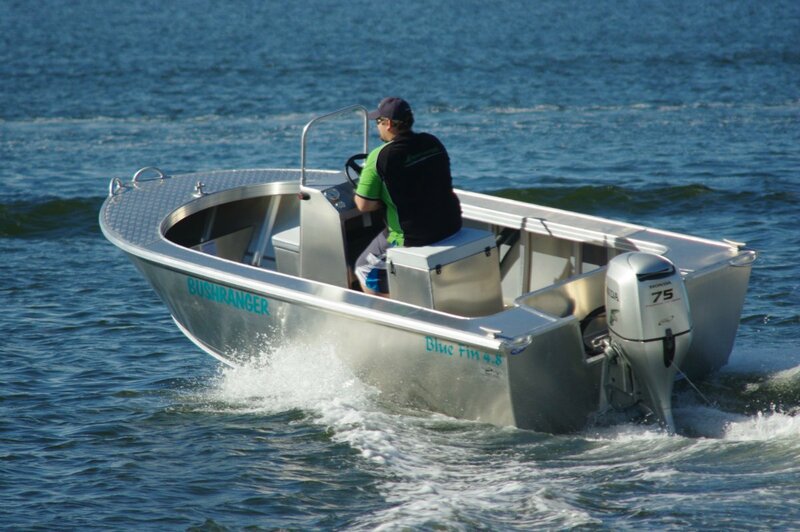 These serve the useful purpose of allowing someone in the water to control the boat. The boat’s structure is particularly rigid. 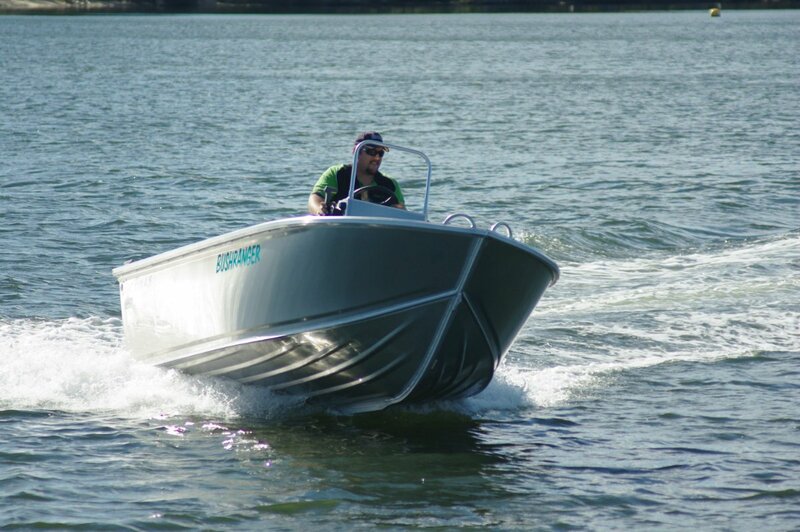 Wide side decks, fully welded, curving into the foredeck provide exceptional stiffness in one plane, and the combination of 3mm plate throughout, plentiful ribs and deep pressings in the bottom add up to a boat built all of a piece. The foredeck has no anchor well; instead a deep shelf with an eye for the cable’s bitter end is fitted beneath it for stowage, and a cruciform bollard provides a tying off point: appropriate simplicity. The console is open at the rear and has a shelf in it giving two storage levels. A pipe frame is fitted where a windscreen would normally be. Its intent is almost certainly to give handholds for standing passengers, but it would not be difficult to build an acrylic screen into it. On the other hand, why bother? The helmsman gets a padded box seat and the mate gets a matching one ahead of the console. Together with the console itself they give a large total storage capacity without squeezing fishing space. They make fine fishing positions for the two who would probably be the usual number of occupants; that wide deck would provide comfortable perching spots for extras. 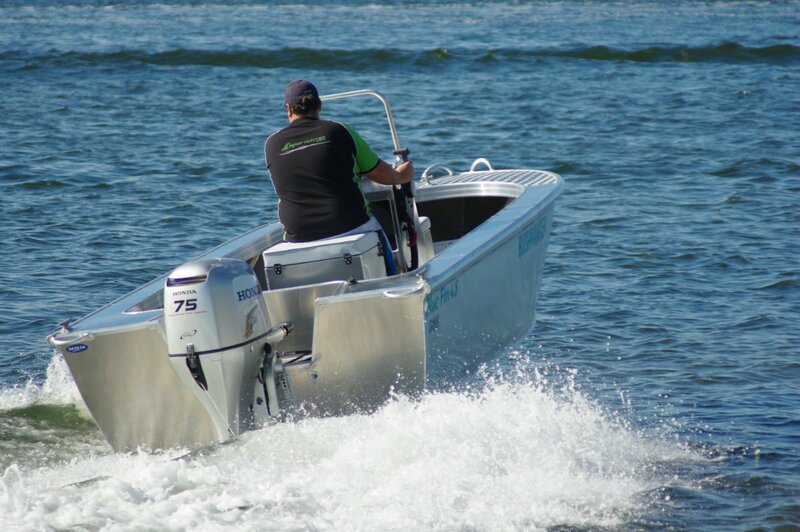 The review boat was powered by a 75hp Honda. We were certainly not overpowered in the sense of the boat not coping – it was far from that – but depending on what you intend for the boat it might be more horses than you need and powering down would lower the cost price. With the Honda on the back the price is $29,980; changing to a not much smaller two-stroke takes it down to $26,000. That said the package as provided was a pleasure to drive. Sparkling straight line performance, crisp handling, and a good ride over what lumps we could find in the water. Centre consoles sometimes have stiff controls due to the number of angles the cables have to pass through between console and motor, but not this one. The agents had fitted it up well enough for fingertip steering and smooth throttle movement. A 60 litre built-in fuel tank is an option, but we had the standard portable tanks and I think they are the way to go. Large boats with thirsts to match and long distances to travel make good use of a built-in tank, but the Bluefin’s modest needs are handled by one or two portable tanks, and why break from the simplicity theme?